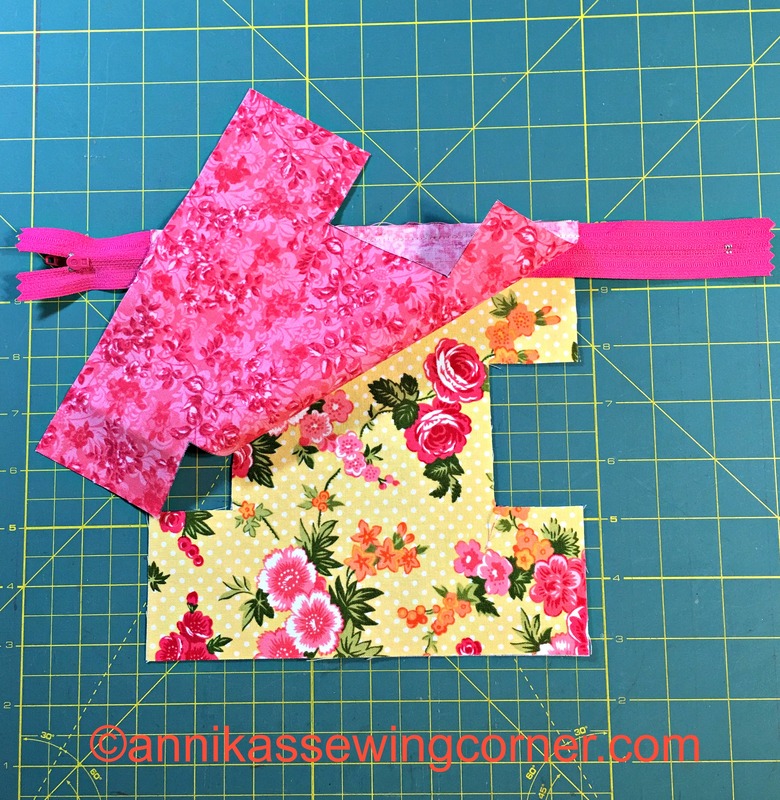 For the small one cut out two 7 3/4″ squares in main fabric and two in lining and two in interfacing. Iron on the interfacing to the main fabric pieces. Cut out the red sections on all pieces, see picture. These measurements are based on using a normal dress zipper. Note that the red sections that you cut out are not centered along the side edges. The scale is not fully accurate in this picture. Sandwich the zipper between main fabric and lining with the right side of the zipper towards the main fabric. 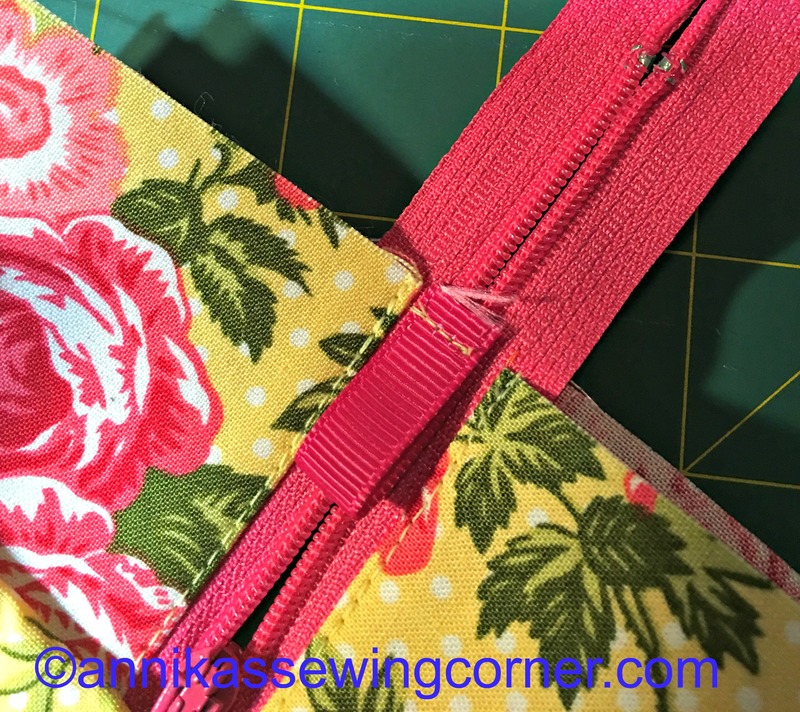 Stitch with a 1/4″ seam allowance and use a zipper foot. All seam allowances are 1/4″ in this project. It makes it easier if the zipper is longer than the top edge. 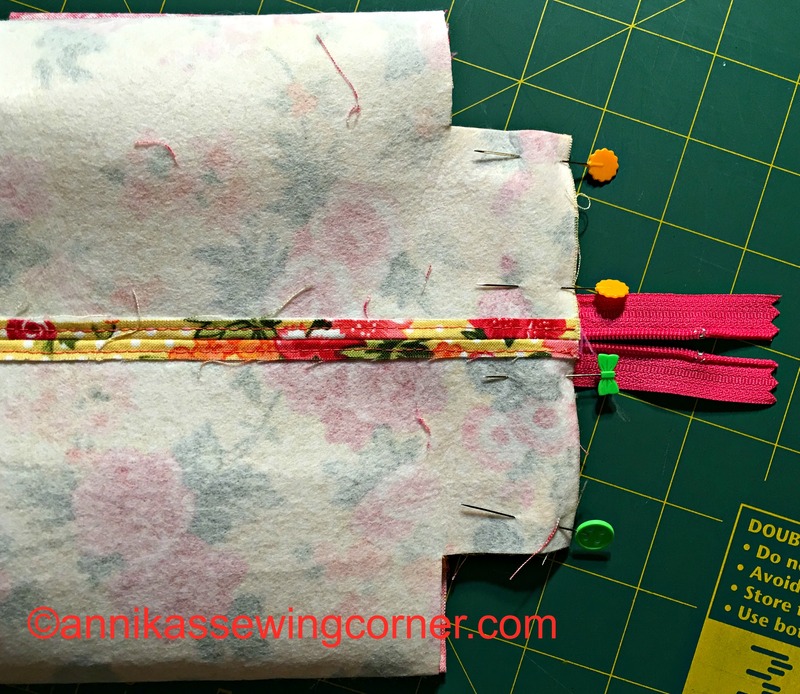 Fold the main and lining pieces away from the zipper, press and top stitch close to the folded edge. Repeat for the other side. Pin the main fabric pieces right sides together along bottom edge and stitch. Press seam allowance open to reduce bulk. Open the zipper and top stitch from the right side about 1/8″ on each side of the bottom seam. Make sure to catch the seam allowance. This step is not necessary but it makes the bottom of the pouch flatter. Fold two 2″ pieces of ribbon or make two tabs of left over fabric and baste to each edge of the zipper, see picture. Make sure the zipper pull is in between the the ribbons. 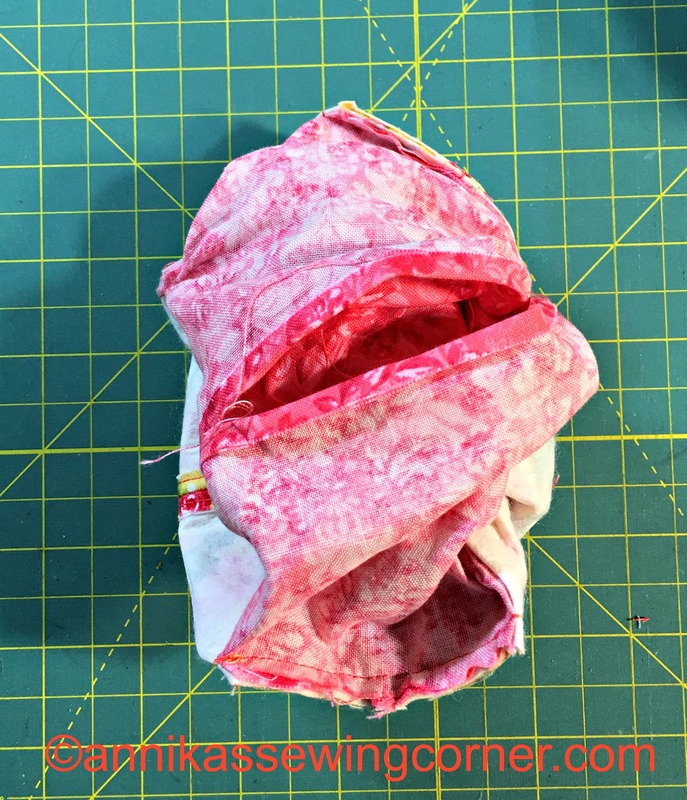 Sew the bottom seam of the lining but leave a 3 – 4″ opening in the middle. Open the zipper about 3/4″ of the way. 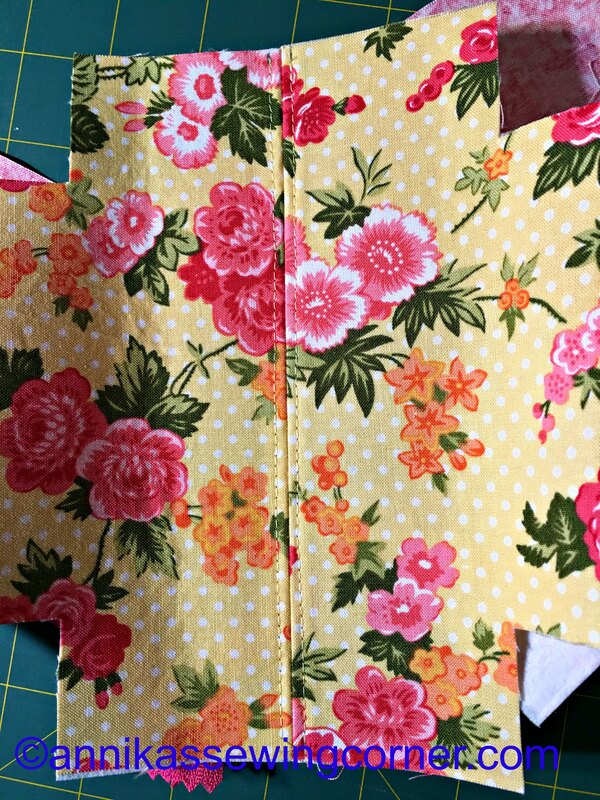 Align the bottom seams with the zipper inbetween and pin all layers together. Stitch the side edges together through all layers. Take it easy over the zipper to avoid needle breakage. 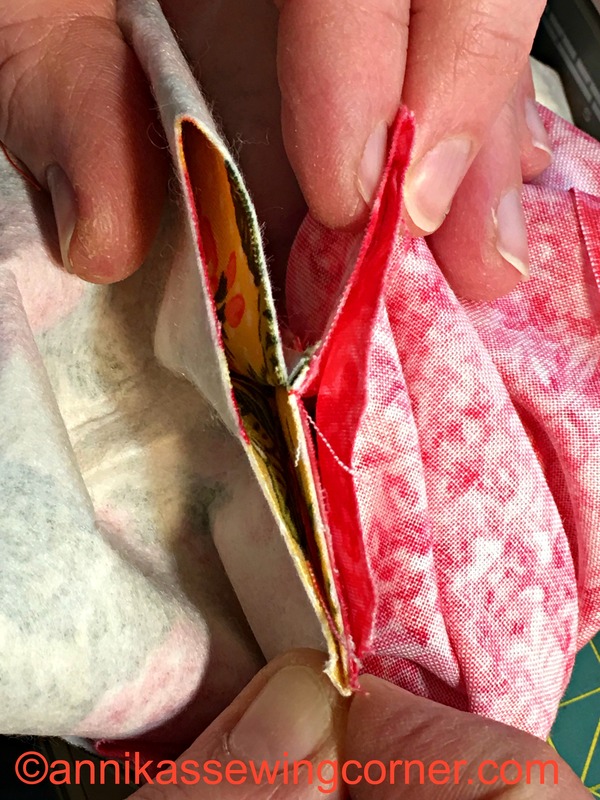 Reinforce the seam at the zipper by reversing and go over the zipper again. Now you can cut off excess zipper. Pin each corner together, see picture, and stitch through all layers. This bit is a little bit fiddly, especially on smaller sizes. After you stitched all corners the pouch will lock like this. Turn to the right side through the opening in the lining. 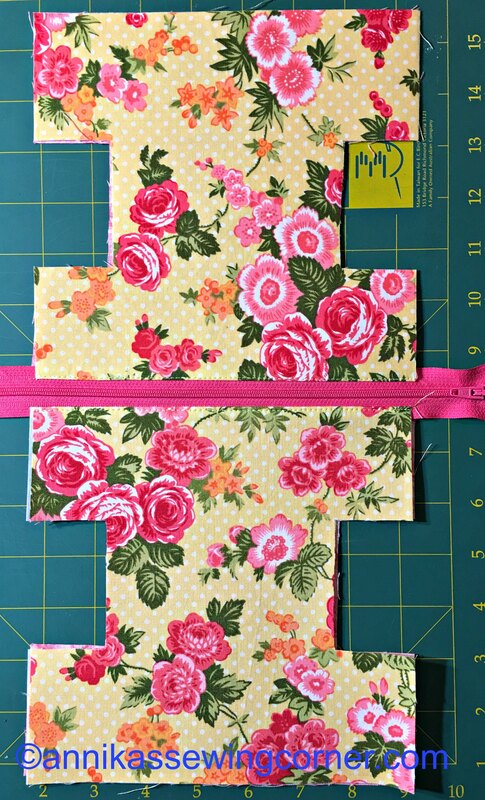 Close the opening by slip stitching by hand or top stitch together on the sewing machine. 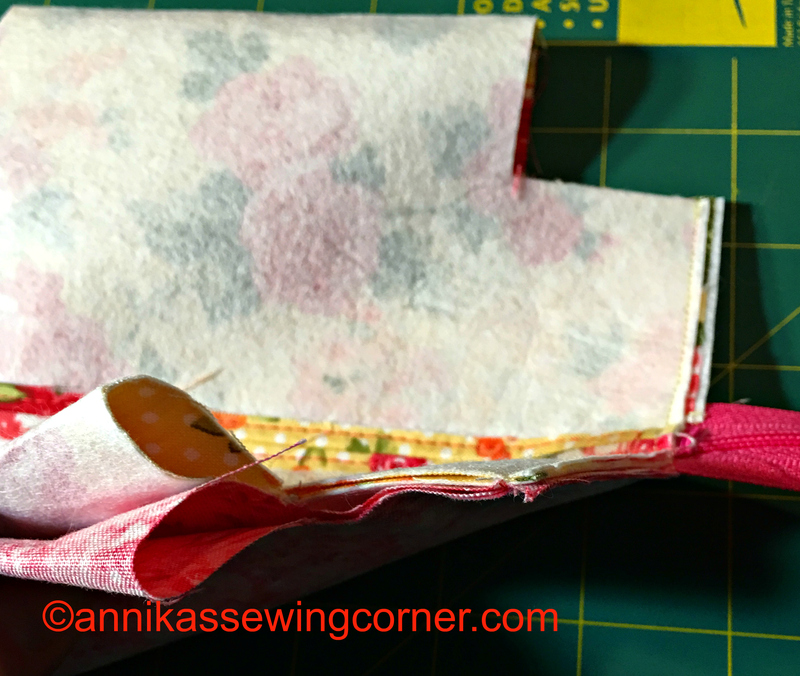 Push the lining inside the pouch and push the corners out and your pouch is finished. 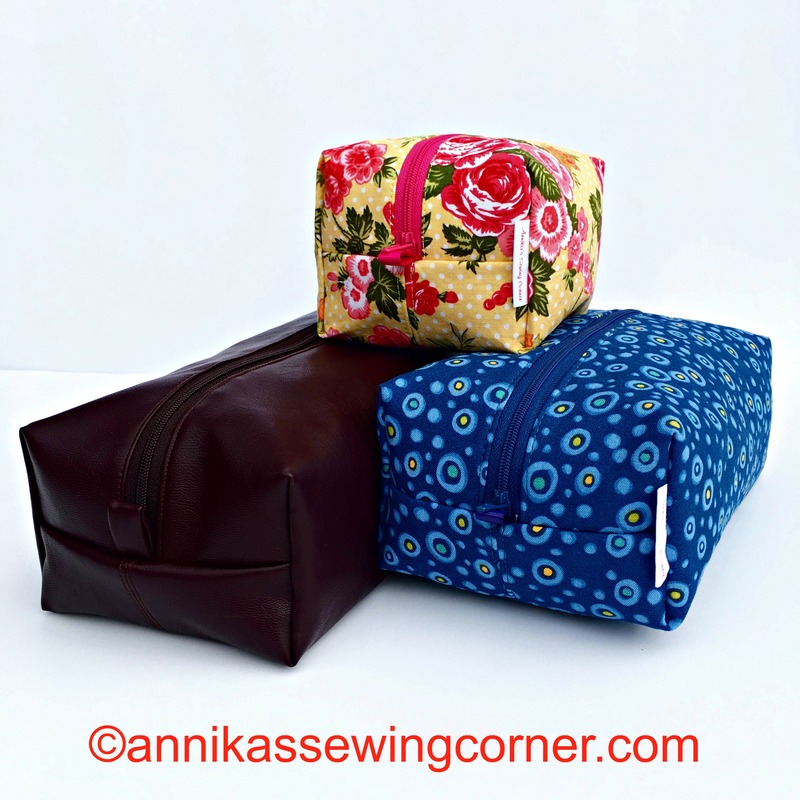 For the middle sized pouch cut a rectangle that’s 7 3/4″ x 11 3/4″ and the larger one is 7 3/4″ x 15″. 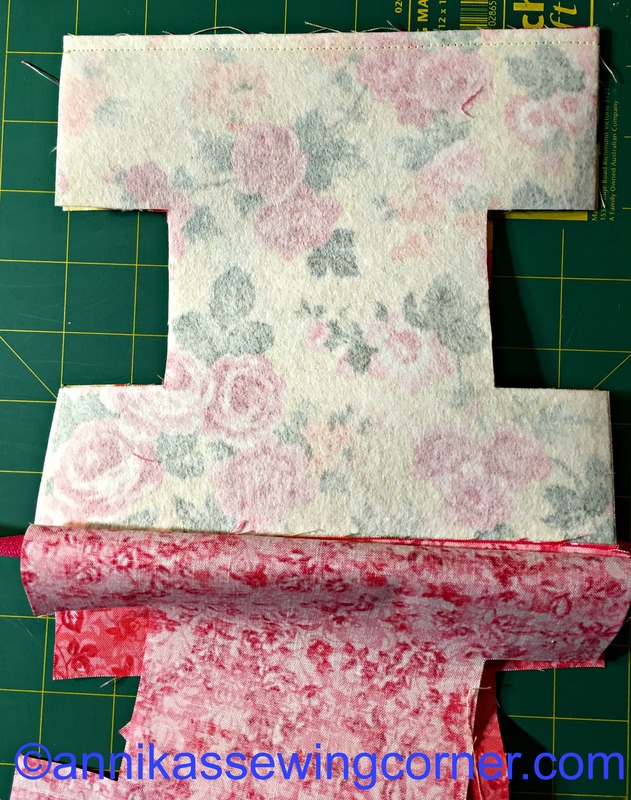 Cut out the same size rectangles along the shorter (7 3/4″ ) edges. I have really enjoyed making these and there are no raw edges and no edges that you have to put binding over. 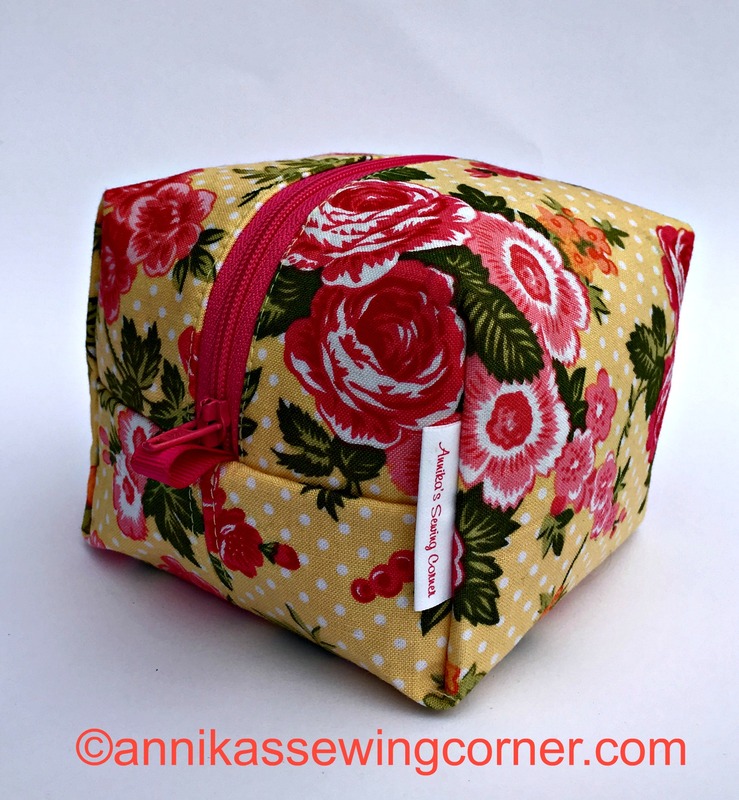 These pouches make great gifts and are great for fabric scraps. I made the large one in pleather/faux leather and I ironed on the interfacing on the lining fabric instead.